Oxy-Cleanse is the perfect colon-cleansing product for people who don’t like to take herbal laxatives or those who want to maintain the benefits of colon hydrotherapy between sessions. It contains a specially processed magnesium peroxide that is infused with oxygen. As the oxygen is released in the intestinal tract, it breaks down old matter and other debris, which are then easily eliminated from the body. 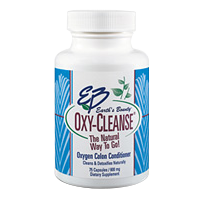 Oxy-Cleanse works gently and effectively without cramping or bloating and will not weaken colon muscles.